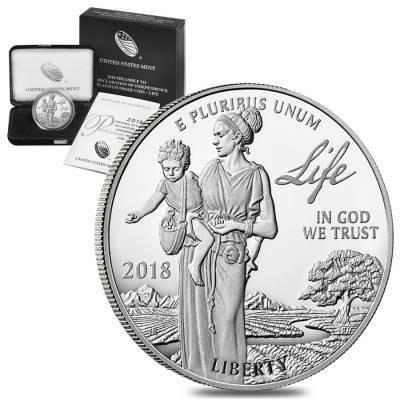 Bullion Exchanges presents the first release in the US Mint three-year program entitled “Preamble to the Declaration of Independence Platinum Proof Coin Series”. 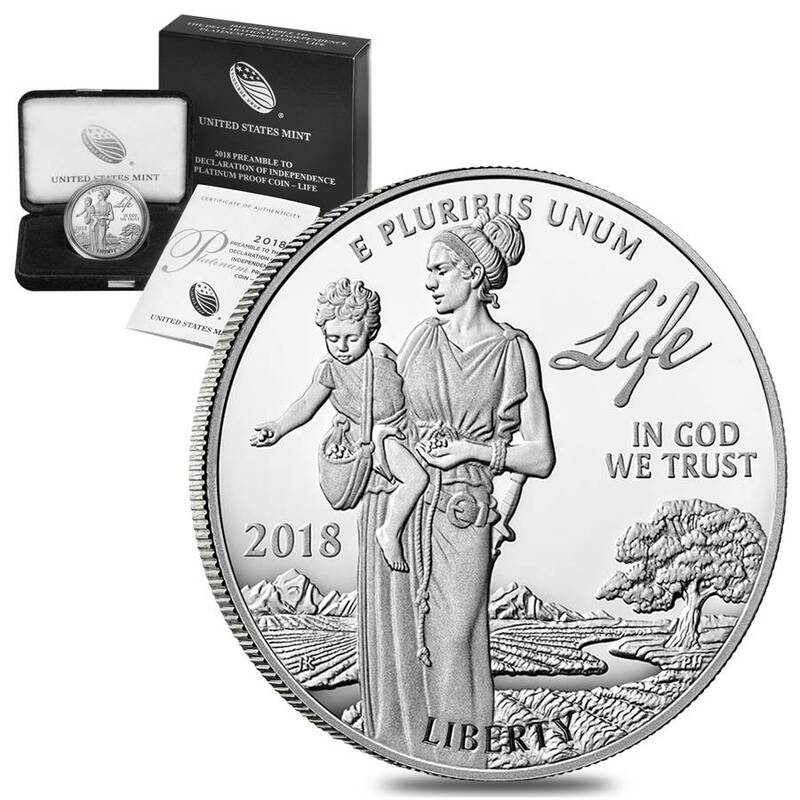 This series design was inspired by the handwritten words from the Declaration of Independence and includes “Life” in 2018, “Liberty” in 2019, and “Happiness” in 2020. This series has been designed to reflect the foundation of American principles: life, liberty, and the pursuit of happiness. 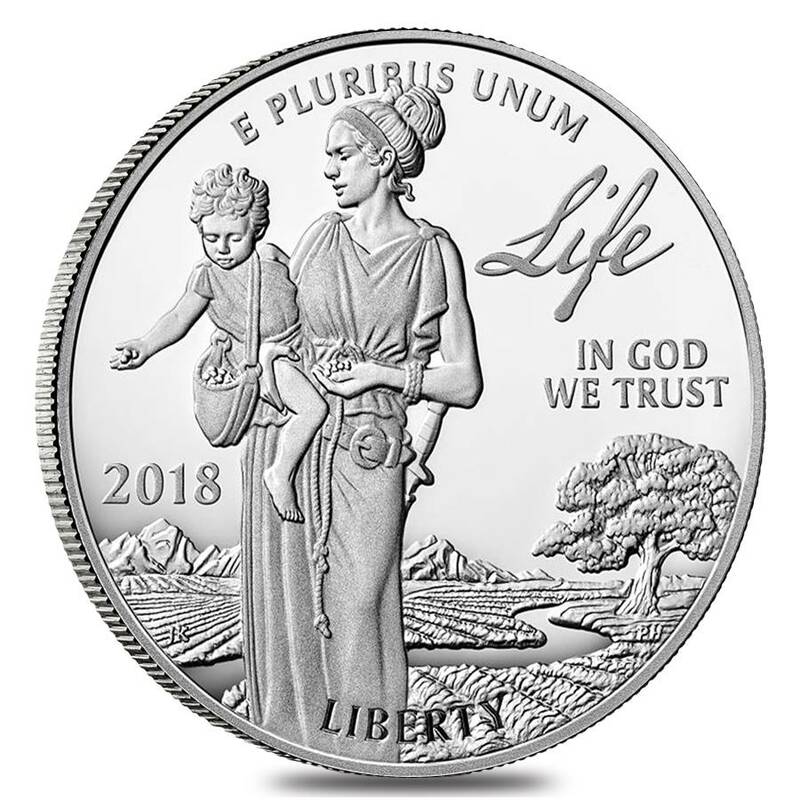 The 2018 obverse design features “Life” theme and showcases Lady Liberty teaching a small child to sow seeds in a field. She carries a sword to symbolize the need to defend life. The furrowed earth represents the forethought and labor required to sustain life. The tree and stream represent nature, suggesting the need to be good stewards of an environment that sustains life. 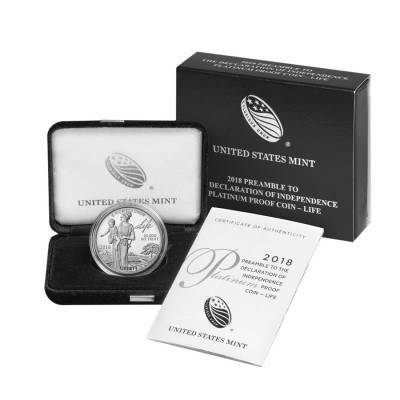 The reverse depicts an eagle in flight carrying an olive branch with its talons. This artwork will remain the common reverse design for the entire series (2018 - 2020). 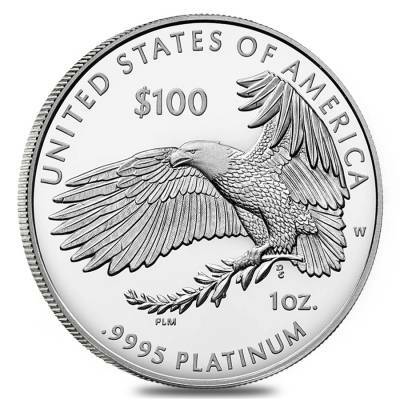 The Platinum American Eagle Coins were first released in 1997 and have featured the same obverse, a Liberty portrait, over the years. 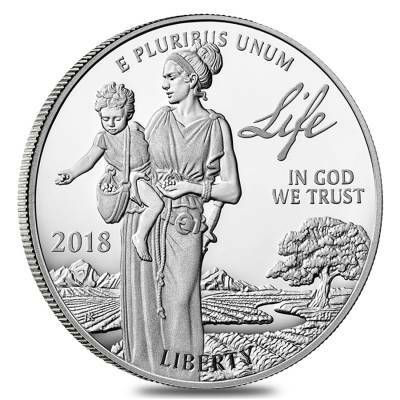 The reverse has cycled through different themes, including “Vistas of Liberty”, “Foundations of Democracy”, “The Preamble to the Constitution”, and “Torches of Liberty”. 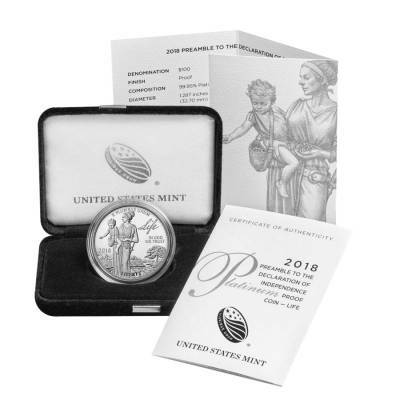 Coin comes packaged in its mint-issued presentation case along with the Certificate of Authenticity. Coin came well packaged in excellent condition. Coin looks even better than pictured. Very detailed, good condition. First time customer, will sure be buying more! So excited for this 3 coin release. Just set an alert for this product as I don't want to miss out on this collection of proof platinum eagles. Look forward to getting mine. With this purchase, you earn 1175 Bullionaire Bucks 1175 BB = $1.18. For every $1 spend, you will earn 1 Bullionaire Buck which is equivalent to $0.001 off a future purchase. 1175 BB = $1.18.